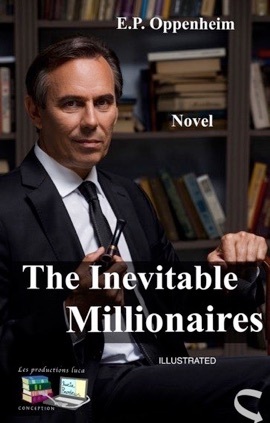 Two brothers inherit a London business, then become millionaire with a social responsibility to spend considerable sums. They have to learn how. Consequently, how will they make it? It was Stephen to whom, by immemorial custom, the letter was brought soon after their arrival at the office on the following morning, but George was looking over his shoulder as he broke the important-looking seal and spread out the document upon the desk. It was George, too, who first grasped the doleful significance of those few typewritten words. "The Post Office contract!" he gasped. "And we quoted at least seven per cent above the recommended price," Stephen groaned. "They like our rubber," George observed lugubriously. "The stability of our firm appeals to them," Stephen muttered. They stared for the second time, in thoughtful silence, at the unoffending sheet of note paper. George made a rapid calculation on the edge of the blotting pad. "It will mean at least another 18,000 pounds profit," he announced gloomily. "We have only made matters worse by putting the price up." Stephen rose dejectedly to his feet, unlocked the safe, and brought to the desk a ponderous-looking private ledger. George glanced over his shoulder. "Our private drawings are certainly increasing," the latter remarked, with a gleam of cheerfulness. "The car has been a great help. And our weekly bills at the 'Milan' are slowly mounting to a more reasonable figure." "A mere drop in the bucket," his brother pointed out sternly. "Our extra expenditure is very nearly covered by the profits of the Rawlingsey Open Theatre. The discrepancy between our income and our expenditure remains ridiculous. There is that letter of our father's in the safe, and we are becoming nothing more or less than misers." For a few minutes the brothers considered this unique problem in silence — the indecent accumulation of wealth against their desire. Their dispositions resisted with difficulty the strain of such a dilemma. There was, for the moment, an expression of almost beatific satisfaction in Stephen's clear grey eyes as he studied one peculiarity of the figures. "I fear that you are something like a hundred and fifty pounds behind me this month, George," he announced. "That is after dividing our joint expenditure." "I can explain that," was the prompt rejoinder. "It is simply because you have replaced the pearl pin which you gave to Louis with a somewhat larger one. As a matter of fact, I have decided to wear a pearl pin myself — perhaps a black one," he added defiantly. "I am told that Martier's is a most expensive shop. I shall go there this afternoon." "That may place me temporarily at a disadvantage," he admitted, "but I shall find means to restore the balance. These matters are trifles, however," he continued, closing the book; "the fact remains — the most disquieting fact, George — that we are showing ourselves less and less able to deal with the continual increase in our profits. We have both accepted the principle that it is our duty to spend a certain portion of our income. We fail to live up to that principle." "I have more clothes and boots and garments of every sort than I shall ever be able to wear," George groaned. "I am in the same position," Stephen declared. "We have, besides a motor car of our own, a suite at the 'Milan' and a ridiculously unnecessary manservant. The terms of our partnership forbid our speculating upon the Stock Exchange or gambling upon horses, and the proportion of our profits to be devoted to charities is also determined by that deed. Our only outlet, therefore, is in personal extravagance or a plausible but unsuccessful private speculation. In the latter direction our efforts have only added to our embarrassments. It only needs Professor Hirschfelt to succeed in his experiments, and I really think we shall be entitled to despair." "There is no chance of Professor Hirschfelt succeeding," George declared. "I know more about rubber than you, Stephen, and I can speak with confidence upon this matter. Mind you, the man's right from the scientific point of view, or we shouldn't have been justified in going in for the speculation at all. He can get a square inch or two of rubber out of a ton of seaweed, but it will cost him fifty times the market price." There was a knock at the door. Their managing clerk put in his head. "Will you see Professor Hirschfelt for a moment, gentlemen?" he asked. "Professor Hirschfelt!" Stephen exclaimed. "What an extraordinary coincidence!"